ARDEX WPM 001 (Superflex Premixed) is a tough, ready to use waterproofing membrane specifically designed for use under tiles. 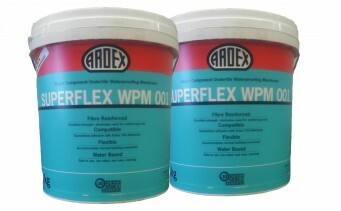 ARDEX WPM 001 has been uniquely formulated with synthetic microfibres to increase its strength and eliminate the need for a separate reinforcement mat. ARDEX WPM 001 is based on the most advanced acrylic polymer technology, and is totally resistant to re-emulsification once cured. ARDEX WPM 001 is flexible, safe to use, low in odour, and is fully compatible with polymer modified tile adhesives. ARDEX WPM 001 is one of the fastest drying one part acrylic membranes on the market – normally ready to tile in 48 hours @ 23°C. WPM 001 meets the Green Building Council of Australia Green Star IEQ-13 requirements for Architectural Sealant when tested in accordance with SCAQMD Method 304-91 Determination of Volatile Organic Compounds (VOC) in Various Materials as referenced by South Coast Air Quality Management Division (SCAQMD) Rule 1168.